Green Steps’ vision is to get businesses of all sizes and all industries to be more sustainable. By creating an online environmental toolkit, their bespoke self-assessment tool will help businesses understand and improve their environmental impact. Sharon Ghouila, founder and managing-director of Green Steps has the idea, the endorsement and the contacts and, is now looking for investment to help her turn her vision into the foundation from which all businesses can adopt data-led, clean-tech innovation to reduce their environmental footprint. Sharon’s business though looks very different to where she started, nearly 5 years ago. 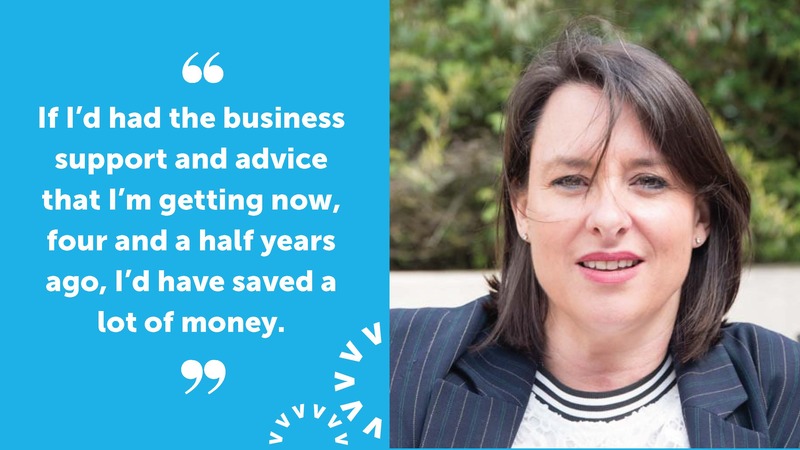 Time on Velocity Growth Hub’s modelling success masterclass got Sharon to look at her business in totally different way and helped her to identify things that she needed to change. As a former events planner and with 25 years’ experience as an environmentalist, Sharon set up ‘The Party Guide’, a directory of companies that produce environmentally sustainable event products and services. The goal was to influence consumers about making informed choices about going green with their party and event suppliers. “I thought the way to improve sustainability and reduce plastic waste was to influence the consumers but I realised that there just isn’t enough choice. With the one-to-one support from Velocity Business Adviser, Jacqueline Day, Sharon talked about her business fears. Together, they challenged her business model and Sharon challenged herself. “I had the right business, just at the wrong time.” The solution was to tackle the market place first. Green Steps was borne and is going from strength to strength. “If I’d had the business support and advice that I’m getting now, four and a half years ago, I’d have saved a lot of money. The resources available for entrepreneurs and businesses is incredible. “that I will always have things to overcome when running my business but there are lots of resources out there to help me. I’ve just got to ask. Velocity Growth Hub is there to promote business growth and prosperity. To do this, they provide a free, central point for businesses based in the South East Midlands to go for information about all the business support, finance and advice available to help businesses achieve their business goals. Their advisers will talk to you about your business, what you want and need to achieve and will help you get to the support that’s right for you. Velocity Growth Hub provides a fully-funded business support project, part-funded through the European Regional Development Fund. This gives SME business over 12 hours of free business support, delivered through one-to-one sessions with a specialist business adviser, workshops on a range of business topics – including the Modelling Success for your Business Masterclass – and access to capital and revenue grants.